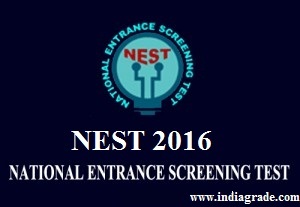 NEST 2016 Application Form: National Entrance Screening Test (NEST) has been conducting every year for seeking admission in National Institute of Science Education and Research (NISER), Bhubaneswar and University of Mumbai [Department of Atomic Energy Centre for Excellence in Basic Sciences (UM-DAE CBS), Mumbai]. This year also the University will going to announce the notification regarding the NEST Online Application Form 2016. So the candidates are advised to keep visiting our indiagrade.com website for getting regular updates about the NEST Application Form 2016. The National Entrance Screening Test (NEST) is planned to conduct in around 52 cities in 79 venues across India. Once the University published the information regarding the NEST 2016 Online Application Form, we will update in our Indiagrade web portal. So you will get all the clear details about the NEST Entrance Exam 2016. You can like our Facebook page for instant info about the NEST 2016 Application Form. Applicants should follow the steps given below to perform NEST Online Registration process and you should apply before the last date of the application submission. You should register yourself at the official website of NEST 2016. You need a valid email id and mobile number to do this process. STEP 1: Fill or Edit Application Form (Basic Information). STEP 2: Make Payment of Application Form. STEP 3: Uploading Process (photo, signature and scanned DD if applicable). STEP 4: Submit NEST Application Form 2016 after verification. STEP 5: Take printout of the application summary page. Candidates are advised to visit the NEST 2016 Exam website (www.nestexam.in) and read the NEST 2016 brochure carefully before starting the online application process. STEP 1: If you are new user, then you should register by using your Name, E-mail, mobile number and password. Login details will be sent to your E mail address and mobile number. STEP 2: Then click the "Apply Online" button to start the Online NEST 2016 Application Form process. Then fill other basic information like educational qualification and click SAVE & PROCEED button. Note down the generated registration number. STEP 3: Now do the payment process through Online mode and Demand Draft (DD). Online payment done by the Credit/Debit card or through Net banking. Demand Draft (DD): Take DD DD in favour of NISER-NEST, payable at Bhubaneswar. STEP 4: Now upload the scanned passport size photograph and sign. All documents should be JPEG files with size less 100 KB each. STEP 5: Verify all the information in the application form before submission. If you want to change any information you need to logout and re-login. NOTE: Please remember that once application submitted, NEST office immediately receives your data. You are not allowed to further edit any information. STEP 6: After you submitted your application, a summary page is being generated. Take the print our of of the NEST application form 2016 for further use. NOTE: If you have chosen Demand Draft as your payment method, you are required to send a printed copy of this summary page along with your DD to the NEST office. If you have chosen SB Collect payment option, you are NOT required to send anything to NEST office.